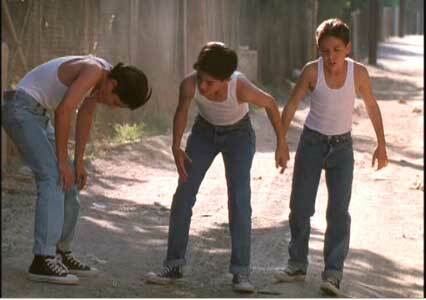 Kyle Gibson, Mario Rendon, and Bryan Burke wear black and navy blue Converse “Chuck Taylor” All Stars in the film. 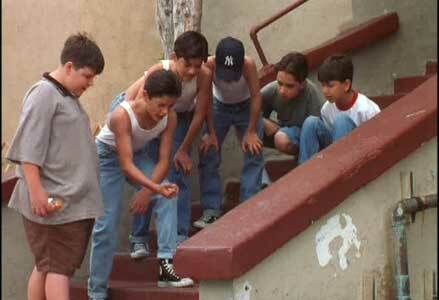 Joey, Louie, and J.J. are True Friends growing up in the Bronx. True Friends takes us to the Bronx, New York in the year 1980. 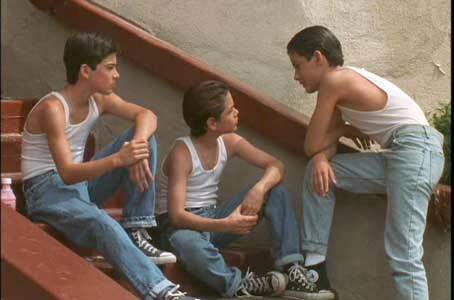 There we meet Joey (Kyle Gibson) and Louie (Mario Rendon), a couple of twelve-years olds living normal lives of kids. One day while at the playground, they see a new kid in the neighborhood, J.J. (Bryan Burke) being hassled by some local bullies who are trying to steal his lunch money. Joey and Louie decide to help J.J. who is very grateful and who turns out to be a kindred spirit. The three soon become inseparable best friends, playing baseball together, participating in neighborhood pranks, and rolling dice for a few coins. Life is great for these kids and the world is their oyster. They seem to have unlimited potential and great futures. But this freewheeling fun life is suddenly changed for ever, when the three accidentally witness the local neighborhood mob boss, Big Tony (John Capadice), kill a man. The three who seem to instinctively know the “code of the streets” decide to keep what they have seen a secret, and never reveal what they know to anyone. 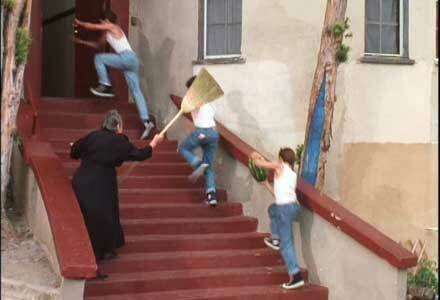 The boys are chased away by the widow after a prank. The film then fast forwards to fifteen years later in the mid 1990s where we see the three kids are now young adults. Joey (James Quattrochi) works at the local Italian social club run by Paulie (Dan Lauria) but actually controlled by Big Tony. Louie (Loreto Mauro) works at his family’s pizza shop, while J.J. (Rodrigo Botero) is a grave digger and fighting heroin addiction. The three have dreams of opening their own business, a neighborhood bar, but never seem able to get it together. No one wants to admit it, but the crime that they witnessed many years ago still haunts them. They have responded by sticking close to home, remaining best friends, and not going out on their own, either for education and training or to get away from the neighborhood and what they saw there. Of the three, J.J. was the least able to cope, and has turned to drugs for solace. If they actually are able to open a bar in the neighborhood, they will have to deal with Big Tony themselves, and risk his displeasure if they screw things up. The only lasting thing that they have is their friendship. The balance of the film is how their lives and friendship plays out, until one of them tragically dies of a brain tumor at age 28, and it is revealed that the film is a tribute to the fallen friend. Some of the local boys shooting craps. True Friends wants to follow in the tradition of other films that portray the “code” of New York City, in this case, the as shown to us in the Bronx. We have seen this in another film reviewed on this website, Sleepers, and in some of the classic films by Martin Scorsese or Francis Ford Coppola. Unfortunately, the code seems somewhat out of date any more, and you wonder why it is so important to protect the knowledge of a criminal act, when it doesn’t seem to do anything for the public good, or even the local neighborhood. True Friends could have been a lot more revealing or interesting if in fact, the friends finally decided to act on what they saw instead of letting it haunt them for the rest of their lives. Like Sleepers, you end up having a lot more sympathy and interest in these characters when they were kids, while their adult lives are so much less inspiring, reminding you instead of broken promises and dreams. Joey, Louie, and J.J. discussing how to handle the heat from their latest prank. 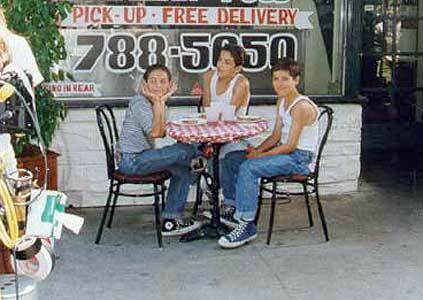 Louie is seated in front of his family’s pizza parlor with Joey and J.J.
Kyle Gibson, Mario Rendon, and Bryan Burke, in their respective roles of Young Joey, Young Louie, and Young J.J. growing up in the Bronx in the year 1980 look great in their “uniforms” of t-shirts or tank tops, blue jeans and black or navy high top chucks. The cinemaphotography is particularly chucks friendly as we see them hanging out together, playing ball, or pulling pranks in the neighborhood. These are the scenes that make the film worth watching. In fact True Friends gets an extra half chuck in its overall rating due to these sequences. The three boys are shocked by the killing that they just witnessed. True Friends. (1998) James Quattrochi, Loreto Mauro, Rodrigo Botero, Dan Lauria and Mackenzie Phillips, Kyle Gibson, Mario Rendon, Bryan Burke. Directed by James Quattrochi. Categories: Drama, Crime and Mystery.